 “By the [end of the war,] trouble and disturbances were very widespread….many suffered from hunger and poverty. People were sold [as slaves]. Vagrants became countless. In the [provinces around the capital,] there was a plague of locusts…Virulent disease accompanied the famine. Also the people were murdered by bandits. Their rivers were filled with floating corpses; bleached bones covered the fields…There was much cannibalism. Famine and pestilence came hand in hand [emphasis added].” Lien-sheng Yang, “Notes on the Economic History of the Chin Dynasty,” Studies in Chinese Institutional History(Cambridge, Mass: Harvard University Press, 1961), 181. Where does it say that the Nephi state is paying for the heavy armor? To be sure Moroni thought it up but my reading has always giving me a sense that it was every citizen’s duty, the the (sic.) Greeks, to fund their own heavy armor so that should the need arise these citizen soldiers could mobilize and go off to war…. The source of Nephite armor is a critical piece to my argument. The argument surrounding the Nephite use of heavy armor was a 40 page chapter in my latest book, and an associated argument occupied 45 minutes at the FAIR Conference. The short version is that the Nephite need to armor their soldiers required money and changed their strategy and tactics. I hadn’t fully considered the source of the armor, and it was apparent I naturally assume the government provided it. Since my book is about reassessing our assumptions of the text that is somewhat embarrassing, but upon further examination (and examining the composition and cost of the armor along the way), I think that criticism is wrong. The first piece of evidence came from a great know why from Book of Mormon Central. These are great write ups that answer pertinent questions by summarize existing literature on the subject. David E. Spencer…suggested that prior to this point, individual soldiers were responsible for arming themselves. This probably resulted in uneven or inadequate armor for the rank-in-file. Under Moroni’s command, each soldier was equipped with a full ensemble of protective gear, which included breastplates, arm-shields, head-shields, and thick clothing. This was good validation, but I wanted to go the primary source to see for myself. I found that a close examination of the text brought more questions than answers, while at the same time reinforcing my assessment of the text. He said that armor was likely self-brought before this but introduced by Moroni at this point as part of his genius. This is where my questions come in, because I wonder about everything in the above paragraph. My research determined that the exact nature of Nephite “breast plate” is unknown. One book was particularly enlightening and I found that North American tribes used wood, shell, antlers (I really enjoyed that one,) bones, stone, cloth, stones in cloth with sand and glue, rods, skins (elk, wolf, buffalo, deer) and even tightly woven strands of willow trees. Jones described “breast plates of rib bones” found in Pueblo sites for example. The Spanish noted that wooden helmets from the northwest were “as heavy as iron.” Captain Cook described a “breast plate of wood” that could stop musket balls at mid-range. So it’s possible to have heavy nonmetal armor that used thick clothing, reinforced by rigid “plates” at selected points. Wooden armor from a Pacific North West tribe. There are all sorts of details we don’t know which complicate definitive analysis. We don’t know the exact composition of armor, what animal(s) provided the hide (if it was hide), what was indigenous around 100 BC, and if the soldiers were supplied or brought their own. I disagree with Spencer’s analysis because the Nephites show the weaknesses that Spencer said would dissuade them from using them: expense, fatigue, availability of material. For example, even if it was just hide or leather armor, supply and demand could make it expensive. When the fur trade exploded in colonial North America the price of beaver peltscould double within a short timeframe. The Lamanites quickly adopted the same sort of armor (Alma 49:8), and initiated what some have called an “arms race.” So whatever material was used was likely in high demand with two armies each of 10-30 thousand soldiers needing to be equipped. It’s true that heavy armor is impractical in many things and ill-suited to the Mesoamerican climate, but it worked well for what the Nephites needed. During the war chapters this largely included: defeating Lamanite armies in the field, fighting in and around cities (such as the plains of Nephihah 52:20), and ambushes along likely routes like Alma 43. They would be less effective after quick marches and in rough terrain. For example, Helaman blamed the fatigue of Antipas twice in two verses (Alma 56:50-51). Moroni focused on marching the Lamanites in circles while keeping his forces “fresh” (Alma 52:28, 31). 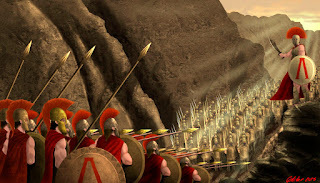 In pursuing insurgents into the “mountains…wilderness,…and secret places” the Nephite army was decidedly less effective to the point of impotence (Helaman 11:25, 28-29). Heavy infantry are far more effective in massed groups. Thus, without the time to arm, equip and mass their soldiers, a mobile army of Lamanites easily slew the Nephites in “small bodies” (Helaman 1:24). Later in Spencer’s book he compared the tendency to decide a battle in a single day to the Greek (and Western) Way of War espoused by Hanson. But the Greeks were heavy infantry wearing heavy metal plates and decided the action by charging each other. I describe the use of heavy infantry on the battlefield in my book all of the advantages and disadvantages are fully present in the Hoplite. So needless to say, This undermines his idea of mobile, lightly armed soldiers with cheap hide armor. Now that I’ve shown why I disagree with the assessment of Nephite armor, lets get back to who supplied it. Rome had armories scattered throughout the empire. In fact, Ferrill argued that it was the loss of logistical edge in terms of both men and material replacement that helped lead to their critical decline in the early 5th century. The Book of Mormon strongly suggests Moroni equipped his men with armor supplied by the state. The verse in question says that that the people of Nephi, or that Moroni, had prepared his people (Alma 43:19). I’m not a grammarian but the text clearly takes pains to point out Moroni’s role in preparing his people with armor. The army “delivered” people from famine (Alma 53:7), suggesting they formed a or the distribution network for the Nephites. Finally, the revolutionary and decisive nature of the armor suggests a mass produced and distributed product that even if built using cheaper material (which would likely undermine its revolutionary impact) would have still represented a significant cost to the government. Not to mention that transferring the cost of warfare back to the state (for supplying the armor) would represent a shift. The government has to pay for the armor somehow. The government didn’t do that because of their largess, but the crisis they were in, the forceful personality of Moroni, and likely the confiscation of land from King Men. So what kind of infantry did the Nephites have? What were breastplates made of? Did the government supply the armor? The answers seem to be that the Nephite infantry was heavy enough to strike fear in their loin clothed enemies, and win bloody encounters where they charged each other in shock battle. Their battles were such that they recalled the clash of the heavy hoplites of ancient Greeks. The “plates“ are far less specific. But judging from the effects of the armor in battle, it was significantly more than hide armor. Judging from the effects on Nephite tactics and strategy, i.e., more success in shock battle accompanied by fatigue, less speed, and limited strategic range, along with what we know historically where the Nephites likely lived, I would wager their armor consisted of thick cloth as a base, with bones and metal plates adding additional protection in key places with arm shields on the non-sword hand. (Simply wrapping a piece of hide around the fore arm can act as padding, so hide could be a good candidate for the shield.) These pieces were not the same as a metal cuirass, but heavy enough to matter. That’s why I use the term “heavier” in my book because it operates in a space between European style heavy infantry and cloth or hide armed armies. Finally, the mass production and distribution on top of strong clues in the text makes it more likely the government sponsored this. Notice the clothe plus additional armor for the head, chest, and non sword hand. The increased cost of this armor and fortifications could have fueled what seemed like a rapacious government, which in turn sponsored a violent insurgency. Much like the British victory in the Seven Years War, the Nephite victory contained the seeds of their own destruction. That’s a good deal to rest on a breast plate, but that’s how amazing the Book of Mormon is. About the title of this post: I borrowed a phrase from Shakespeare about a kingdom for a horse. In this case I wanted to show that because of its effect on the war, and possible negative effects on Nephite society after winning the war, the Nephite use of breast plates cost them their country. I also thought it had a nice ring to it. David E. Spencer, Captain Moroni’s Command: Dynamics of Warfare in the Book of Mormon(Springville, UT: Cedar Fort, 2015), 14. Alternatively, armor may have been more limited and less protective before Moroni introduced the full ensemble of armor mentioned in Alma 43:19. Ironically, I had a free copy of this book so I could provide a blurb. The irony comes because I was good enough to promote a book for Cedar Fort Press, to be placed on book shelves in Deseret Book, but neither organization wanted my books on military history. So I’m good enough to sell books for them, just not my books. David Jones, North American Arms and Armor, Shields and Fortifications (Austin, University of Texas Press, 2004), 85, 107. John Sorenson, Mormon’s Codex: An Ancient American Book, (Salt Lake City: Deseret Book, 2013), 98. I’m basing army sizes based on what seems like a decimal system described by A. Brent Merrill, and the multiple armies occurring in multiple theatres. A. Brent Merrill “Nephite Captains and Chief Captains in the Book of Mormon” in Stephen Ricks and William Hamblin Ed. Warfare in the Book of Mormon (Provo, Salt Lake City: Foundation for Ancient Research and Mormon Studies and Deseret Book, 1991). Arthur Ferrill, The Military Collapse of the Roman Empire, (London: Thames and Hudson, 1988), chapter 2.